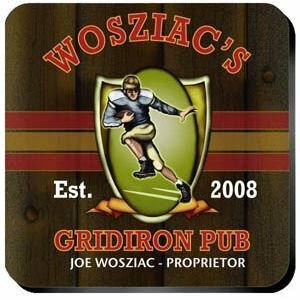 Your football buddies will enjoy using these coasters during game day - especially at the big super bowl party. Full-color design features a classically dressed running back in the Heisman pose. Personalization includes the first and last name of the pub's proprietor plus the year it was established. Coasters are printed with a cork backing to protect your furniture and they are stored in a mahogany caddy.